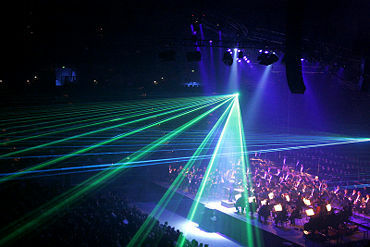 Low-intensity lighting and haze in a concert hall allows laser effects to be visible. Lighting includes both artificial light sources such as lamps and natural illumination of interiors with daylight. Lighting represents a major component of energy consumption, accounting for a significant part of all energy consumed worldwide. Artificial lighting is most commonly provided today by electric lights. However, gas lighting, candles, and oil lamps were used in the past, and are still used in certain situations. Proper lighting can enhance task performance or aesthetics, whereas there can be energy wastage and adverse health effects of lighting. Indoor lighting is a form of fixture or furnishing, and a key part of interior design. Lighting can also be an intrinsic component of landscaping. Lighting fixtures come in a wide variety of styles for various functions. Some are very plain and functional, while some are pieces of art in themselves. Nearly any material can be used, so long as it can tolerate the heat and is in keeping with safety codes. Proper selection of fixtures is complicated by the requirement to minimize the veiling reflections off printed material. Since the exact orientation of printed material may not be closed controlled, a visual comfort probability can be calculated for a given set of lighting fixtures. Lighting is classified by intended use as general, localized, or task lighting, depending largely on the distribution of the light produced by the fixture. General lighting fills in between the two and is intended for general illumination of an area. Indoors, this would be a basic lamp on a table or floor, or a fixture on the ceiling. Outdoors, general lighting for a parking lot may be as low as 10-20 lux (1-2 footcandles) since pedestrians and motorists already used to the dark will need little light for crossing the area. Downlighting is most common, with fixtures on or recessed in the ceiling casting light downward. This tends to be the most used method, used in both offices and homes. Although it is easy to design it has dramatic problems with glare and excess energy consumption due to large number of fittings. Uplighting is less common, often used to bounce indirect light off the ceiling and back down. It is commonly used in lighting applications that require minimal glare and uniform general illuminance levels. Uplighting (indirect) uses a diffuse surface to reflect light in a space and can minimize disabling glare on computer displays and other dark glossy surfaces. It gives a more uniform presentation of the light output in operation. However indirect lighting is completely reliant upon the reflectance value of the surface. While indirect lighting can create a diffused and shadow free light effect it can be regarded as an uneconomical lighting principal. Recessed lighting (often called "pot lights" in Canada, "can lights" or 'high hats" in the U.S.) is popular, with fixtures mounted into the ceiling structure so as to appear flush with it. These downlights can use narrow beam spotlights, or wider-angle floodlights, both of which are bulbs having their own reflectors. There are also downlights with internal reflectors designed to accept common 'A' lamps (light bulbs) which are generally less costly than reflector lamps. Downlights can be incandescent, fluorescent, HID (high intensity discharge) or LED, though only reflector incandescent or HID lamps are available in spot configuration. The illuminated ceiling was once popular in the 1960s and 1970s but fell out of favor after the 1980s. This uses diffuser panels hung like a suspended ceiling below fluorescent lights, and is considered general lighting. Other forms include neon, which is not usually intended to illuminate anything else, but to actually be an artwork in itself. This would probably fall under accent lighting, though in a dark nightclub it could be considered general lighting. Underwater accent lighting is also used for koi ponds, fountains, swimming pools and the like. Vehicles typically include headlights and tail lights. Headlights are white or yellow lights placed in the front of the vehicle, designed to illuminate the upcoming road and to make the vehicle more visible. Tail lights are always red and are placed in the rear to quickly alert other drivers about the vehicle's direction of travel. The white portion of the tail light is the back-up lamp, which when lit, is used to indicate that the vehicle's transmission has been placed in the reverse gear, warning anyone behind the vehicle that it is moving backwards, or about to do so. In addition to lighting for useful purposes, and early 1970s, manufacturers would sometimes backlight their logos and or other translucent paneling. In the 1990s, a popular trend was to customize vehicles with neon lighting, especially underneath the body of a car. In the 2000s, neon lighting is increasingly yielding to digital vehicle lighting, in which bright LEDs are placed on the car and operated by a computer which can be customized and programmed to display a range of changing patterns and colors, a technology borrowed from Christmas lights. Lighting design as it applies to the built environment, also known as 'architectural lighting design', is both a science and an art. Comprehensive lighting design requires consideration of the amount of functional light provided, the energy consumed, as well as the aesthetic impact supplied by the lighting system. Some buildings, like surgical centers and sports facilities, are primarily concerned with providing the appropriate amount of light for the associated task. Some buildings, like warehouses and office buildings, are primarily concerned with saving money through the energy efficiency of the lighting system. Other buildings, like casinos and theatres, are primarily concerned with enhancing the appearance and emotional impact of architecture through lighting systems. 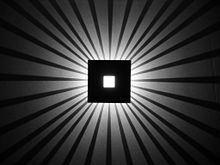 Therefore, it is important that the sciences of light production and luminaire photometrics are balanced with the artistic application of light as a medium in our built environment. These electrical lighting systems should also consider the impacts of, and ideally be integrated with, daylighting systems. Factors involved in lighting design are essentially the same as those discussed above in energy conservation analysis. Mathematical modeling is normally used for complex lighting design, whereas, for simple configurations, tables and simple hand calculations can be used. Based on the positions and mounting heights of the fixtures, and their photometric characteristics, the proposed lighting layout can be checked for uniformity and quantity of illumination. For larger projects or those with irregular floor plans, lighting design software can be used. Each fixture has its location entered, and the reflectance of walls, ceiling, and floors can be entered. The computer program will then produce a set of contour charts overlaid on the project floor plan, showing the light level to be expected at the working height. More advanced programs can include the effect of light from windows or skylights, allowing further optimization of the operating cost of the lighting installation. Practical lighting design must take into account the gradual decrease in light levels from each lamp owing to lamp aging, lamp burnout, and dirt accumulation on fixture and lamp surfaces. Empirically-established depreciation factors are listed in lighting design handbooks. Luminance is a photometric measure of the density of luminous intensity in a given direction. It describes the amount of light that passes through or is emitted from a particular area, and falls within a given solid angle. The SI unit for luminance is candela per square meter (cd/m2). The CGS unit of luminance is the stilb, which is equal to one candela per square centimeter or ten kcd/m2. Analysis of lighting quality to insure that adverse components of lighting (for example, glare or incorrect color spectrum) are not biasing the design. Training of building occupants to utilize lighting equipment in most efficient manner. Use of natural light. Some big box stores are being built (Ca 2006 on) with numerous plastic bubble skylights, in many cases completely obviating the need for interior artificial lighting for many hours of the day. Specification of illumination requirements is the basic concept of deciding how much illumination is required for a given task. Clearly, much less light is required to illuminate a hallway or bathroom compared to that needed for a word processing work station. Prior to 1970 (and too often even today), a lighting engineer would simply apply the same level of illumination design to all parts of the building without considering usage. Generally speaking, the energy expended is proportional to the design illumination level. For example, a lighting level of 80 footcandles might be chosen for a work environment involving meeting rooms and conferences, whereas a level of 40 footcandles could be selected for building hallways. If the hallway standard simply emulates the conference room needs, then twice the amount of energy will be consumed as is needed for hallways. Unfortunately, most of the lighting standards even today have been specified by industrial groups who manufacture and sell lighting, so that a historical commercial bias exists in designing most building lighting, especially for office and industrial settings. Beyond the energy factors being considered, it is important not to over-design illumination, lest adverse health effects such as headache frequency, stress, and increased blood pressure be induced by the higher lighting levels. In addition, glare or excess light can decrease worker efficiency. Analysis of lighting quality particularly emphasizes use of natural lighting, but also considers spectral content if artificial light is to be used. Not only will greater reliance on natural light reduce energy consumption, but will favorably impact human health and performance. In 1849, Dr. Abraham Gesner, a Canadian geologist, devised a method where kerosene could be distilled from petroleum. Earlier coal-gas methods had been used for lighting since the 1820s, but they were expensive. Gesner's kerosene was cheap, easy to produce, could be burned in existing lamps, and did not produce an offensive odor as did most whale oil. It could be stored indefinitely, unlike whale oil, which would eventually spoil. The American petroleum boom began in the 1850s. By the end of the decade there were 30 kerosene plants operating in the United States. The cheaper, more efficient fuel began to drive whale oil out of the market. John D. Rockefeller was most responsible for the commercial success of kerosene. He set up a network of kerosene distilleries which would later become Standard Oil, thus completely abolishing the need for Whale Oil lamps. Compact fluorescent lamps (aka 'CFLs') use less power to supply the same amount of light as an incandescent lamp. Due to the ability to reduce electric consumption, many organizations have undertaken measures to encourage the adoption of CFLs. Some electric utilities and local governments have subsidized CFLs or provided them free to customers as a means of reducing electric demand. For a given light output, CFLs use between one fifth and one quarter of the power of an equivalent incandescent lamp. However, CFLs contain minute amounts of mercury, a toxic substance. Disposal of CFLs needs to be done with care, according to local regulations. ↑ David Vernon (2007), Light bulbs—Don’t be Dim. Light up your Life! Retrieved August 25, 2008. ↑ 2.0 2.1 Paul Hawken, Amory B. Lovins, and L. Hunter Lovins, Natural Capitalism: Creating the Next Industrial Revolution (Boston: Little, Brown and Co., 2000, ISBN 0316353000). ↑ Craig DiLouie, Advanced Lighting Controls: Energy Savings, Productivity, Technology and Applications (Lilburn, GA: Fairmont Press, 2006, ISBN 0881735108). ↑ James S. Robbins, How Capitalism Saved the Whales The Foundation for Economic Education. Retrieved August 25, 2008. Lighting Research Center Rensselaer Polytechnic Institute.